For other uses, see Cotopaxi (disambiguation). Cotopaxi is an active stratovolcano in the Andes Mountains, located in the Latacunga canton of Cotopaxi Province, about 50 km (31 mi) south of Quito, and 33 km (21 mi) northeast of the city of Latacunga, Ecuador, in South America. It is the second highest summit in Ecuador, reaching a height of 5,897 m (19,347 ft). It is one of the world's highest volcanoes. Since 1738, Cotopaxi has erupted more than 50 times, resulting in the creation of numerous valleys formed by lahars (mudflows) around the volcano. The last eruption lasted from August 2015 to January 2016. Cotopaxi was officially closed by the authorities to climbing until it reopened on October 7, 2017. On a clear day, Cotopaxi is clearly visible on the skyline from Quito and is part of the chain of volcanoes around the Pacific plate known as the Pacific Ring of Fire. It has an almost symmetrical cone that rises from a highland plain of about 3,800 m (12,470 ft), with a width at its base of about 23 km (14 mi). It has one of the few equatorial glaciers in the world, which starts at the height of 5,000 m (16,400 ft). At its summit, Cotopaxi has an 800 × 550 m wide crater which is 250 m (820 ft) deep. The crater consists of two concentric crater rims, the outer one being partly free of snow and irregular in shape. The crater interior is covered with ice cornices and rather flat. The highest point is on the outer rim of the crater on the north side. Many sources claim that Cotopaxi means shining pile or mountain in an indigenous language, but this is unproven. According to locals who speak Quechua, “coto” means moon and “paxi” means neck. This refers to the crater of Cotopaxi that looks like a crescent moon. The mountain was honored as a "Sacred Mountain" by local Andean people, even before the Inca invasion in the 15th century. It was worshiped as “rain sender”, that served as the guarantor of the land's fertility, and at the same time its summit was revered as a place where gods lived. With 87 known eruptions, Cotopaxi is one of Ecuador's most active volcanoes. The first recorded eruption of Cotopaxi was in 1534. Cotopaxi's most violent eruptions in historical times occurred in the years 1742, 1744, 1768, and 1877. The 1744 and 1768 events destroyed the colonial town of Latacunga. In the 26 June 1877 eruption, pyroclastic flows descended all sides of the mountain melting the entire ice cap, with lahars traveling more than 100 km into the Pacific Ocean and western Amazon basin draining the valley. The city of Latacunga was again leveled completely due to the mudslide deposits. The eruption on 19 June 1742 was witnessed by the scientists Pierre Bouguer and Charles-Marie de La Condamine, members of the French Geodesic Mission, as they descended from nearby Guagua Pichincha. There was a major eruption from 1903 to 1904, and minor activity persisted until at least 1940 and possibly 1942. (Note that direct observations of minor eruptions can be difficult because of bad weather, hence the uncertainty about the 1942 "eruption.") The same source also reported increased thermal/seismic, non-eruptive activity in 1975 and 2002. In the increased activity of 2002, fumarolic activity and sulfuric emissions increased and ice around the inside and on the southeastern side of the cone started to melt. However, no actual eruption was observed. In 2015, two large phreatic (steam) eruptions in the morning of the 14th of August marked a new phase of volcanic activity. The volcano "remains in a very abnormal situation. In August, 2,100 earthquakes were recorded and emission rates of sulfur dioxide reach approximately 20,000 tonnes per day". The government estimates some 300,000 people are at risk from the volcano in the provinces of Cotopaxi, Tungurahua, Napo and Pichincha. The first European who tried to climb the mountain was Alexander von Humboldt in 1802; however, he only reached a height of about 4,500 m (14,760 ft). In 1858 Moritz Wagner investigated the mountain, but he could not reach the summit either. On November 28, 1872, German geologist Wilhelm Reiss and his Colombian partner, Angel Escobar, finally reached the summit of Cotopaxi. In 1873 it was summitted by German Geologist Moritz Alphons Stübel and four Ecuadorians, Rafael Jantui, Melchor Páez, Vicente Ramón and Eusebio Rodriguez. In 1880 British mountaineer Edward Whymper and the Italian guides Jean-Antoine Carrel and Louis Carrel made the third recorded ascent of Cotopaxi and spent a night on the summit. Painters Rudolf Reschreiter [de] and Hans Meyer reached the summit in 1903 and many of Reschreiter's paintings feature a view of Cotopaxi. In the late 20th century, summiting Cotopaxi became a major tourist draw. The José F. Ribas Refuge (Refugio José Félix Ribas) was built in 1971 at an elevation of 4,800 m (15,750 ft) and enlarged in 2005. A tragedy occurred here on Easter Sunday 1996 when an avalanche partially buried the Refuge and dozens of tourists. The glacier above the Refuge was probably weakened by an earthquake that had shaken the entire Province of Cotopaxi for several days prior to the avalanche. In the warm midday sun a huge portion of the ice wall broke loose. Being Easter there were many day visitors on the mountain who were buried in the ice and snow. Those trapped in the Refuge broke windows on the downhill side to climb to safety, but 13 people died on the slope above. The Refuge itself is located in a valley and consequently vulnerable to future avalanches. The volcano has an inner crater inside the outer crater. Colors show elevations. Climbing Cotopaxi to the summit is quite popular with up to 100 climbers attempting it on weekends. Today, mountain guide companies offer regular guided climbs of the mountain. Climbers grade the conventional route alpine PD (Peu Difficile) or WS (Wenig Schwierig) — or PD/WS+ (indicating "Mildly Difficult PLUS"). Use of crampons and ice axes are mandatory as snow and ice slopes of up to 50 degrees are encountered and climbers should be on belay and use aluminum ladders to cross one or two of the crevasses. A 4WD track goes up from the national park entrance to a carpark at 4600 m altitude on north side, just below the José F. Ribas Refuge. This stone mountain hut — owned and operated by Grupo Ascensionismo del Colegio San Gabriel — is situated 200 m higher at 4800 m (a 40-80 minute uphill hike). Here climbers can spend the night and begin their summit bid in the early morning without any intermediate camps. (Typically no more than about half of those attempting to summit Cotopaxi make it to the top after a daunting — though non-technical — six-hour scramble.) Summiting normally starts around 12:30 am to reach the summit at latest 7:30 am and then return to the hut before the snow melts and glacier crevasses move/evolve. As of July 28, 2014, the Ribas Refuge is under construction. Tour operators shuttle their clients up to the top of the 4WD track once in the afternoon for a glacier skills class, and then again to start the climb around midnight, spending the intervening hours eating dinner and resting at a hostel lower down by the lakes. Adventure tourism operators in Quito also offer mountain biking tours from the Refuge downhill along the dirt track. In April 2015, the volcano began to show signs of unrest, and came back to life. There was a large increase in earthquakes (including harmonic tremors) and SO2 emissions. IGEPN reported slight deformation of the edifice, suggesting an intrusion of magma under the volcano. As of 25 July, the unrest continued, and the most recent significant eruption was a phreatic (ash and steam) eruption that occurred on August 14 and 15, 2015. Ash was deposited heavily in areas close to the volcano (including damaging farmlands on the flanks of neighbouring volcanoes such as El Corazon)  and thinly as far as Quito, affecting southern and central areas of the city. Future Cotopaxi eruptions pose a high risk to the local population, their settlements and fields. 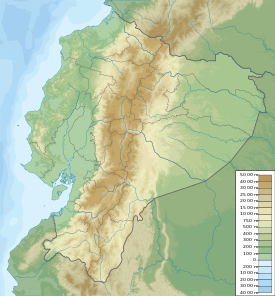 The main danger of a significant eruption of Cotopaxi would be the flash-melting of its summit glacier, resulting in devastating lahars which would travel down the flanks of the volcano, guided by river valleys whose origins lie at the volcano. Danger from normal, explosive eruptive activity is limited to within Cotopaxi National Park however, the great distances that lahars, of the significant size that Cotopaxi's glacier could produce, greatly increases the hazard areas to include all river valleys leading from the volcano. If there were to be a very large explosion, it would destroy (to the north) many of the settlements within the valley in the suburban area of Quito (pop. more than 2,000,000). Another city which would be in great danger is the regional capital Latacunga which is located in the south valley and has been destroyed at least twice in recent history (1768, 1877) by lahars caused by volcanic activity. Cotopaxi is commonly depicted in the traditional paintings of the indigenous people of Tigua as the volcano holds significant cultural value. Cotopaxi by Frederic Edwin Church, 1862. Cotopaxi was the subject of important works by painter Frederic Edwin Church in 1855 and 1862. In the poem Romance by Walter J. Turner (1916), Cotopaxi is one of the romantic locations that has stolen the poet's heart. In the American film Close Encounters of The Third Kind (1977), the SS Cotopaxi, a ship named Cotopaxi that disappeared in 1925, appears in the Gobi Desert. American rock band The Mars Volta have a song named after the mountain. In The Star (1897), a short story by H. G. Wells, Cotopaxi erupts with a tumult of lava that reaches the coastline in a day. In Shadrach in the Furnace (1976), a science fiction novel by Robert Silverberg, an eruption by Cotapaxi becomes known as "the night of Cotopaxi". It starts a series of disasters and uprisings that establish in the early 21st century a world dictatorship by the Mongolian Genghis Mao. ^ "Ecuador ultra-prominent peaks". peaklist.org. Retrieved 2011-08-12. ^ a b c d e "Cotopaxi". Global Volcanism Program. Smithsonian Institution. Retrieved 2013-11-07. ^ "Distance from Quito to Cotopaxi". distancecalculator.globefeed.com. Retrieved 2018-12-01. ^ "Cotopaxi". Encyclopædia Britannica. Retrieved 2018-12-01. ^ "El Geofisíco señala que las emisiones de gas no están relacionadas con el magma del Cotopaxi" (in Spanish). El Comercio. Retrieved 2018-12-01. ^ "Cotopaxi - Eruptive History". Global Volcanism Program. Smithsonian Institution. Retrieved 2018-12-01. ^ Biggar, John (1996). The High Andes: a guide for climbers. Scotland: Andes Press. ISBN 1-871890-38-1. ^ "NASA Earth Explorer page". Earthobservatory.nasa.gov. Retrieved 2012-05-23. ^ Ferreiro, Larrie (2011). Measure of the Earth: The Enlightenment Expedition that Reshaped Our World. Basic Books. p. 215. ISBN 978-0465017232. ^ "INFORME MENSUAL COTOPAXI AGOSTO 2015 - IGEPN". ^ a b "Cotopaxi volcano (Ecuador): increased seismic activity, volcanic unrest". Volcano Discovery. 3 June 2015. Retrieved 2018-12-01. ^ "Diario la Hora, 7 de Agosto del 2015". Se registran lahares de poco alcance en el volcán Cotopaxi. Diario La Hora. Retrieved 2015-09-08. ^ Greenspan, Eliot (2011). Frommer's Ecuador and the Galápagos Islands. USA: Wiley. p. 155. ISBN 978-0-470-94951-1. ^ Rachowiecki, Rob (1997). Climbing & Hiking in Ecuador (4th ed.). Bradt Publications. p. 16. ISBN 978-1898323549. ^ "Cotopaxi, a short climbing history". Footsteps on the Mountain blog. 7 June 2018. ^ Whymper, Edward. Travels amongst the Great Andes of the Equator. John Murray, 1892, pp.136-156. ^ "Cotopaxi Refuge, Hut & Campground Information". SummitPost. 12 Feb 2014 . Retrieved 2014-06-14. ^ "The Cotopaxi Volcano". NASA. Retrieved 2009-10-10. ^ Biggar, John (1999). The Andes: a guide for climbers (2nd ed.). Scotland: BigR Publishing (Andes). ISBN 0-9536087-0-0. ^ "A Restless Volcano Puts Ecuador on Edge Once More". WIRED. 17 June 2015. Retrieved 2018-12-02. ^ "Ecuador declares state of emergency over volcano". BBC News. 16 August 2015. Retrieved 2018-12-01. ^ "Ceniza del volcán Cotopaxi afecta a poblados, cultivos y ganado del centro de Ecuador" (in Spanish). Retrieved 2017-02-07. ^ "El Instituto Geofísico reportó dos explosiones en el volcán Cotopaxi; ceniza cae en el sur de Quito". El Comercio. Retrieved 2017-02-07. ^ "Mapa de Peligros - Instituto Geofísico - EPN". www.igepn.edu.ec (in Spanish). Retrieved 2017-02-07. ^ Samaniego, P; Mothers, P; Hall, ML; Yepes, H; Castro, M; Aguilar, J (2004). LAHARZ hazard maps of the northern drainage of Cotopazi volcano, Ecuador. Pucon, Chile: IAVCEI General Assembly. ^ Hope, Jayne. "Pintores de Tigua: Indigenous Artists of Ecuador". Adventure-life.com. Retrieved 2012-05-23. Wikivoyage has a travel guide for Cotopaxi. "Cotopaxi" . Encyclopædia Britannica (11th ed.). 1911. "Cotopaxi" . The New Student's Reference Work . 1914.